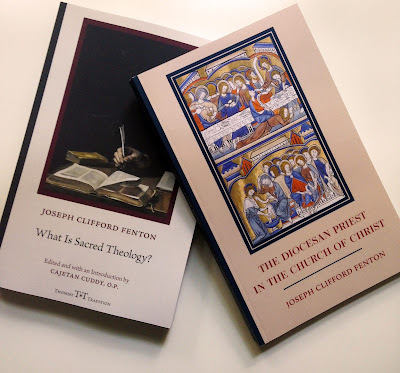 I am pleased to announce, once again, reprints from Cluny that deserve the attention of thoughtful traditional Catholics everywhere, especially in seminaries and house of formation. Please note that these editions are not mere facsimiles but entirely and handsomely re-typeset. What follows is based on the press release from the publisher. Cluny Media has released new editions of two of Msgr. Fenton’s books: What Is Sacred Theology?, a profound yet accessible explanation of what makes Catholic theology unique, and The Diocesan Priest in the Church of Christ, a powerful aid for diocesan seminarians and priests seeking to identify the concrete form of their vocation. What Is Sacred Theology? (originally published as The Concept of Sacred Theology) is the second volume in Cluny’s “Thomist Tradition” series, which aims to contribute to the renewed interest in the Thomist tradition among contemporary philosophers and theologians with new editions of rare Thomistic texts. Edited and introduced by Cajetan Cuddy, O.P., What Is Sacred Theology? offers clarity and wisdom for all those interested in sacred truth and desirous of its saving effects. The Diocesan Priest in the Church of Christ (originally published as The Concept of the Diocesan Priesthood) is a masterful description of the mission and ministry of the diocesan priest. Treating with precision and clarity the scriptural and theological basis of the priestly office, Fenton provides a comprehensive description of the powers, duties, and graces of that office. As powerful today as at the mid-way point of the twentieth century, this book is remarkably well-suited to developing an effective response to the “vocations crisis” of our present age. Rorate Caeli readers will find especially interesting the penultimate chapter “The Mass of the Diocesan Priest,” which affords a window not only into perennial truth but into the interior strength of a Church that was able to speak this confidently in 1951. As bad as things are today, one can sense at least the beginnings of a reemergence of the same sacerdotal and Eucharistic spirit in many of today's seminarians and younger clergy. Both books are available for purchase on www.amazon.com and www.clunymedia.com. *Subscribers to the Cluny newsletter receive a discount code and free shipping on their first purchase.